Finance Committee Head says Israel doesn't need world to agree Jerusalem is important, threatens to vote against Maaleh Adumim annexation. 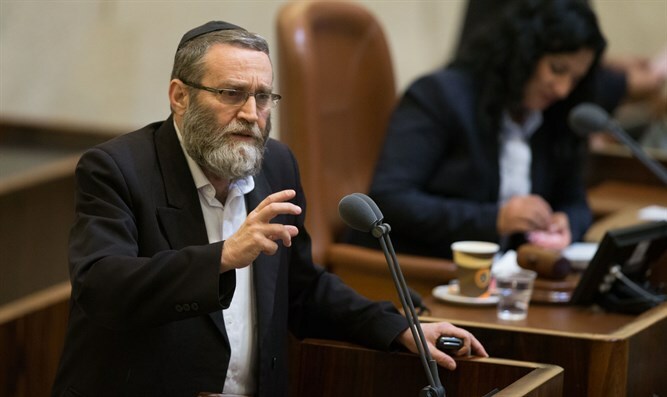 Finance Committee Head Moshe Gafni (UTJ) said on Sunday evening his party would vote against the Maaleh Adumim Annexation Law, and blamed his opposition on the "behavior" of Maaleh Adumim Mayor Benny Kashriel. In an interview with Kol Barama Radio, Gafni said, "Benny Kashriel is trying to limit Maaleh Adumim's haredi community. I told the Prime Minister that if they don't want haredim in Maaleh Adumim, we won't vote to annex Maaleh Adumim. I will convince the other members of UTJ to also vote against the annexation." Gafni also criticized the White House for the discussion on moving the US Embassy from Tel Aviv to Jerusalem. "It's superfluous, we don't need the world to agree that Jerusalem is important. We need to keep Shabbat (Sabbath) in Jerusalem and we need to protect the Temple Mount's holiness, both of which are much more important," he said. On Sunday night, the White House announced Trump had already sent architects to Jerusalem and that discussions on the topic had begun. Jerusalem Mayor Nir Barkat said, "I congratulate President Trump on his historical announcement to discuss moving the US Embassy to Jerusalem. Trump is proving he is a true friend of Israel and keeps his promises. The recent announcement tells the entire world that the US recognizes a united Jerusalem as the capital of Israel." "We will be happy to help the US government execute the move in the smoothest and fastest way possible," Barkat promised.